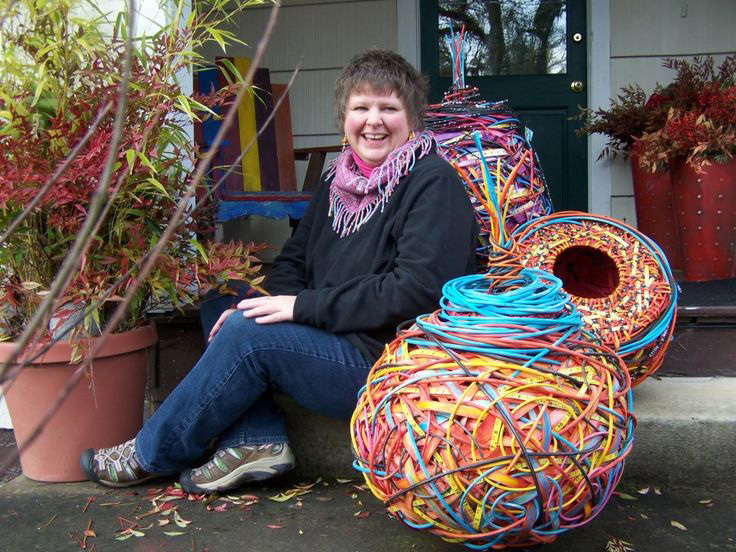 Shannon Weber creates woven objects and sculpture from various fibers. She is known for her somewhat obscure collections of Pacific NW sea kelps, coastal debris, and many other kinds of found objects and wax. She has no limits on what materials may be an option. She often treats her studio as an art lab in which she pounds materials with rocks, sets materials on fire with a torch or boils them to add markings or produce flexibly. She believes that each material item carries its own mythologies from places collected that adds to the ever changing dialogue of each work. Each design is joined by surface layers of weaving, stitching and cold connections that can be 3 to 7 layers deep. Her sculptures often seem to carry unintentional reflections of nomadic traditions and other mysterious archaeological thoughts to which Shannon views as talismans or amulets for others personal collections and spaces. Her works have been broadly exhibited, awarded and collected nationally in places such as the Lancaster Museum of Art where she won the “Fiber Art National Award of Excellence”, Bellevue Art Museum Art Festival ”Carol Duke Award” and the Mulvane Art Museum where her works are held in the Museums’ Permanent Collection, Encaustic Art Institute Permanent Collection among others. She also held a 3 month fall residency at the Sitka Center for Art & Ecology 2009. In 2014 she exhibited at the National Association of Women Artists in NY, along with being published in the 2012 Fiber Art Now Spring, 2014 Inspirational Issue 1, Spring Surface Design and Winter e/A Encaustic Art Magazine.